The Crazy Armstrongs: This last Year .. Sorry so long! WOW, where do I begin telling our journey without being a full novel. I guess I begin with the start of this year.. nope not early enough.. a little before then.. nope...i guess I can say the minute the twins were born.. I knew I wanted more children! When they entered this world I really truly felt a new kind of joy and excitement I had never felt before. They were so beautiful.. much more than I had always dreamed of. The instance I got settled in with being a new mother, I felt a STRONG desire to have more children. I felt myself battling and telling myself that I already have two beautiful blessings so why am I acting so selfish to want more? At night I would have dreams of getting pregnant with a miracle child or twins again. Each month the twins got older my desire got stronger. I kept telling myself I would wait until the twins were 2 to talk to Scott on how I felt. But believe me I did drop strong hints all the time. Scott wanted more children also but he TRUSTED the Lord fully... and since we had two blessing already a boy and a girl and TWINS what more could we ask for. Scott knew God was big enough if He wanted to give us a miracle baby He would! Miracle baby (in Heidi's terms): The reason I call it a miracle baby is because we did in vitro with our twins not that our twins weren't miracles they sure were, but just this time by pure miracle we could conceive on our own. So, the twins turned 2 and I couldn't stop thinking about having more kids .. after watching so many miracle pregnancies and babies come into this world around me .. my heart melted .. my desire was stronger than it had ever been before. So, strong Scott knew there was no turning away from it. After many long discussion and feeling God leading us we decided to proceed with doing in vitro again. Our SAME Dr. from Jacksonville was now in ORLANDO.. I knew it was a sign from the Lord. Also, we found out Scott's health insurance would paid for all of it. YEAH God I just knew he was opening the doors with excitement. We started the treatment in Dec. 2008 and I started full shots while Scott was gone in Hawaii.. the one day they wanted to schedule the retrieval was one of the two days of Scott being home in three weeks.. it was clear God was lining this up for us! The Dr. joked with us that we could have twins again.. oh boy would i been excited! We were so full of ourselves we didn't just expect God to give us one baby but two. Everything went smoothly and then the day after the retrieval we didn't get a phone call.. I knew something was up because they usually call you to tell you how everything looked if embryos were growing etc. .. no news .. I knew that this couldn't be good. Scott was calm and said I'm sure it was fine. Tuesday morning around noon feeding the kids lunch I got a phone call.. Dr. Brown's cell phone I had a pit in my stomach, I knew. He said it didn't work and nothing fertilized into embryos. Sorry if you don't know or understand the whole process ..but basically he said it didn't work.. if we wanted to wait a month we could try it again. It was like a TON brick fell on me and I started to cry so hard.. This was the first time the kids saw me cry and knew I was so hurt. Brooke kept saying mama "why you crying, mama you crying, mama why you sad" she was so sad. It broke my heart .. I just knew deep inside Scott did not want to do this again. It was my one chance and GOD slammed the door on us. I called Scott to tell him the news and he was shocked and didn't know what to say. That was a rough day.. hurt and frustrated. Scott worked late that night and I was just mush in God's hands asking him why.. show me answers God why? I felt everything in my life has to be difficult .. I was tired of fighting for my desires.. that He placed on me. Scott and I struggled BAD with our relationship soon after. I was right.. Scott did not want to go forward with another treatment. He really felt it was God closing the door. He felt unsure about the whole in vitro process .. he just did not have a good feeling towards it and for sure not with moving forward doing it again. I was doing a Bible study in the middle of this called A Women's heart.. wow it kept talking about submitting to your husband and that was my prayer everyday that I could just submit to him and follow him but in the same prayer that God would change his heart and want a child so bad he would do anything to have one. After a few months of a very divided home Scott and I went away to regain love and respect for each other. We decide to pray like crazy everyday for God to give us a miracle.. we could feel our hearts were changing and we were growing closer.. peace was coming slowly giving it all to the Lord for Him to lead us.. help us lose the control and show us His way..not ours. This summer in May I had help lead our girls study and they talked about doing another one over the summer. I didn't want to do it because I wanted a break but I knew God wanted me to see how many people were interested and 12 girls signed up.. wow God, I guess i need to do the study plus a few NEW girls wanted to join us so it was clear. We went the first day and I did not want to be there.. bad mood, nothing worked, I wasn't prepared, tired, the kids didn't want to be there.. I kept saying over and over in my head WHY God am I doing this study .. I just need a break this summer. Little did I know he had BIG plans for me! After the study discussion we did prayer request and a NEW girl sitting next to me said her and her husband have decided to adopted from Ethiopia WOW my ears perked up, my heart jumped and I instantly had a million questions. Her soft spoken soul touched my heart instantly. I knew right then, this is exactly why God wanted me to do this summer study. With each week yes the study spoke to me.. right now I'm looking back in my book my staggered thoughts not totally making sense.. You must put total TRUST on the Lord, forgetting what is behind and straining towards what is ahead, let God's story overflow into everyone else's life. 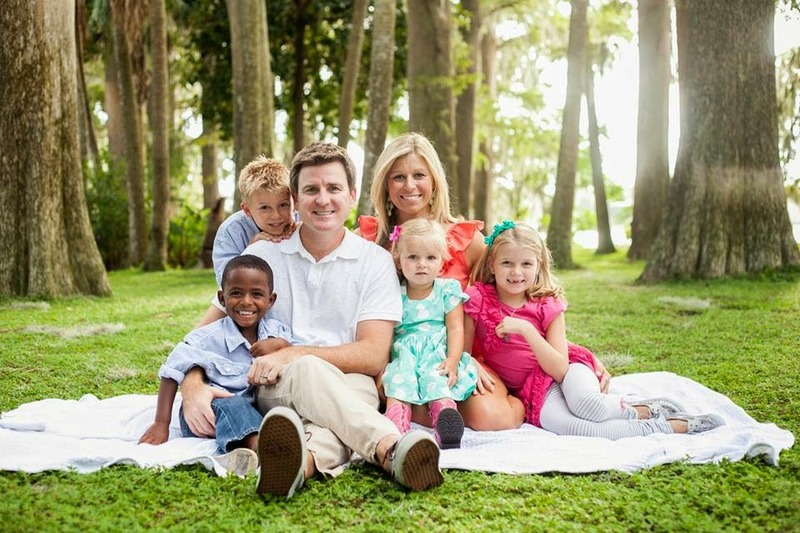 I think a lot of time we miss God's Glory working in us.. this is the time to lift the empty cup and let him pour in..The Lord was working in me that is for sure and the best part was prayer request when I got to hear more about Jessica's story of adoption... my heart was always racing. About the third week I had enough nerve to say it out loud.. when prayer request came to me.. i said I'm thinking God might be calling me to adopt and I was shaking and nervous to even say the words, but I don't want to give up having my own children. Jessica looked right into my eyes and said HEIDI they are NOT your children they are ALL GODS CHILDREN. I knew those words were straight from God piercing my heart. I was shaking.. I couldn't wait to get out of there. I got in the car and cried and cried.. LORD is this what you are calling me to do? No not me.. I can't handle it.. it's too much, REALLY LORD me? I could feel my heart was transforming all the way home. Scott was out of town.. I didn't want to share my feelings over the phone.. this was huge.. I wanted to make sure this is where God is calling me before I move forward. That week the Lord soften my heart.. the next week in Prayer request I told the group I wanted to talk to Scott about the baby situation and asked them to pray for us. I wrote that week for me to have total Christ-like thoughts about having another baby.. show Scott and I your will LORD. Soon there after, Scott and I went to Key West for vacation.. just the two of us. My heart had been changing more and more each day. For the trip, I pulled a few books off the shelf and just happened to grab one about orphan children in Africa.. my heart was breaking even more. I was excited and nervous to share it all with Scott.. I didn't want to pressure him into a conversation as I knew he would clam up.. I just told him I had something to share about the baby situation and whenever he felt comfortable to talk he could bring it up.. The second day on the trip Scott turned while I was reading and said "OK, what's been on your mind?" My heart was pounding.. and I told him all about my bible study and how I really felt like God was changing my heart about adoption and He LIT up .. I could feel this overwhelming PEACE come over us wow.. I said what do you think? He said he was totally for it without hesitation, just like he had been waiting all these years for me to see it... he had never been so sure and certain with me before. I said REALLY??? with excitement!! WE were so united, so on the same page, so at peace and so in love. We instantly started talking about the country to adopt from and without any hesitation we knew AFRICA! That story will be coming soon .. on why Africa. So for this next year, come follow our next steps of faith in the journey to ETHIOPIA, Africa to bring home a loving beautiful child of God! We are so excited to see all that is going to be in store. I just feel so blessed that God chose us! I am so happy to read your story and see your heart. Thanks for being so open. It is refreshing to know the real you! Yall are in our prayers daily. We love the newest Baby Armstrong already! God bless you and your family, Heidi. I think adoption is wonderful! I will pray for you and your family as you go through this exciting process! heidi, this is such exciting news! i'm so happy for ya'll...God is good. What wonderful news! It makes me so happy to see what God has brought to your life. Good luck in your new journey! 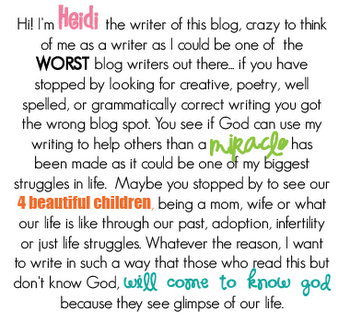 My sister Kelsey Linduff gave me your blog address: so excited for you! We're in the process of adopting a baby girl from Rwanda. I'd love to walk this path with you! Very cool story! That would be so neat if we ended up traveling together!! Wishing you a quick referral.